I recently filed bankruptcy and then was informed that my case is under audit by the US dept of justice. I do not know whether this is a random audit or an audit based on some kind of "red flag" on their end. I have provided all the requested documents to support my case but I would like to do some work to make sure that my bankruptcy goes through successfully without any hitches. Initially i thought Law keep away products would be best, but seeing as how the audit has already begun now I'm leaning towards a legal honey jar. Any suggestions? A legal honey jar would be a good choice. If you know the name of the auditor, make sure to include that in your jar. 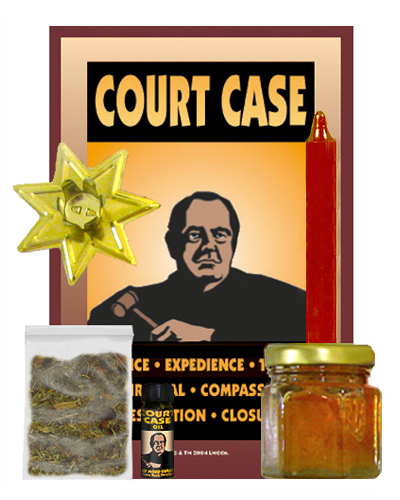 I Would like to know if I could use a court case honey jar to make my lawyer favor my case and work harder on my case since I know he is very busy and has plenty clients . Also is there any extra herbs I can add instead along with the small packet they give ? Also, I would like to know the appropriate oil and candle color to use. I also have a refrigerator magnet with his office information he sent to me could I add this in the honey jay ? Yes you could work that on your lawyer and the magnet would be a good choice. Add some Deers Tongue to encourage his eloquence on your behalf, as well as a little calamus root to compel him to work hard for you. Brown is the traditional candle color for court cases. You could work Court Case oil on it. Good morning Ms. Aida! I know it's late but I cannot sleep. I got my honey jar and I am confused. In the instructions it lists: Bodily concerns. Now is that something of mines or is that something of the person I want to sweeten? If that is something of the person I want to sweeten, will a printed photo suffice? Also, I thought about narrowing down how many people I want to sweeten to it being just the judge and the mom and two fathers instead of it being the them and their attorneys, the children's attorneys, ACS attorney, caseworker, etc. since they are really the decision makers. Yes, names and photos are fine. Good afternoon, I had a question about whether the CCHJ is the most applicable. My husband has been involved in a long standing case from when we lived in CA. It has been 15 years on and off. Now the court system has tracked him down here in AZ and garnishing my wages as I am the spouse. He is self employed so they are having a hard time getting his $$. I have the CCHJ kit - would this be the best route? I have the names of the AZ lawyers who are in charge of the garnishing as well as all the parties involved against my husband. This could be a good option for you. It certainly won't hurt! Yes I know I know that is why I am still keeping my belief...and waiting patiently. I finished that Friday, January 22, 2016. Didn't look like it would be in our favor though. So far the children are being split up into two families. It has been a year and a half now since we've seen the children. I light High John the Conqueror powder each day. Am I doing anything wrong? Yu might consider a reading to see what is going on and what else needs to be done. Some of our AIRR members (and I do not personally specialize in court cases) do work with court cases. I pray that all works out. "Reaching out" and "messaging" folks is not the same as hiring folks to work on your case. Many of us in AIRR receive dozens -- even hundreds -- of "reaching out" type emails and phone calls every week. Depending on how busy we are with our work, we will either ignore them, send a form letter in reply, or have one courtesy conversation before getting back to work. Remember, this is a job for us. Book a reading or consultation. Or, do the work yourself! The way some of their websites are arranged, you ask questions first via email if no phone number and then book a consultation. Anyways, Khi Armand finally got back to me and I was able to book a consultation with him. This is Marin Graves. I am not on this forum very often, but did happen to see this. Although it looks like your post was awhile ago, I thought I would respond to your message that mentions you had tried to reach out to me, but did not get a response... I have a full-time assistant so it would be extremely rare for an email to not be responded to within 24 hours. If yours was overlooked, I do apologize. I specialize in legal matters, and should you still need assistance, please feel free to send an email or call Marin@MarinGraves.com (530)272-8276 (Although email response is much faster). Legal and court case matters can be stressful if it is an area you are unfamiliar with. Slip and fall cases are often matters that an insurance company will present a lower settlement offer, in hopes of an early agreement, and more importantly, avoiding public publicity that could taint the building complex, reputation, and have others potentially come together to form a class action suit. Typically attorneys will not take on a slip and fall matter (on a contingency) unless there are clear facts and the evidence is strong. The cost of litigation is so extremely high, that they have to make sure they have a chance at a victory. Zoning laws, building codes, and ordinances are pretty black and white. To find that they were in violation of one of the codes, pretty much makes for a slam dunk case.... unless their was what they call "contributory negligence" which means that you were somewhat responsible for the injury. For example, you were wearing roller-skates, or moon boots. (Which I know you were not). The "typical" timeframe could be 6 month to a year, so it may be a long journey, but could be well worth it. I do apologize for just receiving your message. I really appreciate you getting back with me. I just don't really get on here as much. I guess you can say that I have lost most if not all hope as far as my case (in which is a family court custody case and not a slip and fall case) as well as the assistance that I have been getting from the forums or the suggested places I should seek help. I actually did get a response from your assistant, only it was a month later and by that time I had already gotten feedback from Khi Armand. I have accepted his services although I am a bit skeptic since I have only heard from him twice regarding my request and he has stated he wanted me to do some things and meet someone but that was two weeks ago and I saw him a month ago. I call and email him but there is no way of getting in contact with him. I don't know, it just seems as if I have been duped yet again and here comes the next and final court date (Wednesday) to my custody hearing. So now I am just stuck feeling as if I have again wasted money that I do not have for a reading and services that at first seemed promising but now feels hopeless...and things have just gotten extremely worse. I believe what he said is true, even believe that this may be the reason why there has been no communication between he and I. So I am just trying to cope with the situations at hand and am trying to figure out how I can move on. Hi I was involved in a car accident a year and a half ago and I got injured and now I am suing. I was reading the court case spell ideas page and I saw that you can use this to have the judge favor your case and give large settlement.... It didn't really go into much detailS what would be a good petition to put.. Also I want a specific settlement amount.. Can I add in how much I want... Also if the case doesn't go to trial... What names can I add in the jar? I am so sorry that you were injured. That's just terrible news. "__________ (<---Judge's name) will rule in favor with _______ (<---your name and birthdate) in lawsuit and award a large amount of money"
I usually don't ask for a specific amount of money because the petition becomes too demanding. Hello what I can get to beat 2 speeding tickets? I have a hearing for SOcial security disability in a month and I wanted to start a court case honey jar. I had seen what he looks like in person but don’t have an actual photo of him online I just know the judges name. 1) What would be a good petition to put in the jar to have him approve me for benefits and give me past benefits from two years ago that is owed to me? 2) also what would be the best day to start this honey jar? Just state your petition clearly and succinctly: "So & So approves me for benefits and gives me past benefits from two years ago that are owed to me." Start it anytime you want! Although you could start it on a Thursday, because that's a good day for money spells. You can add multiple persons and petitions to a honey or sweet jar. The only issue is if the candles burn messy or dirty, you do not know by the signs of the candle which person in the jar is resisting the work. I would use court case oil as its made with the authentic items to receive favor from a judge and to win in court. The idea of a sugar jar is to sweeten them, adding dominating seems to work a bit against the idea of sweetening. Imagine someone buying you chocolates then demand at once you eat them lol. You can use dominating and compelling in other works related to this such as burning candles or a paper in your shoe dressed with the oils, wear on your hands as you shake hands with other lawyer.